Hello friends! I've been busy working away on client projects - and those kind of come first, don't they? For now, why don't you check out the ever so amazing, House Industries! I've been ogling their beautiful typefaces for months. A favourite of mine - Eames Century Modern. 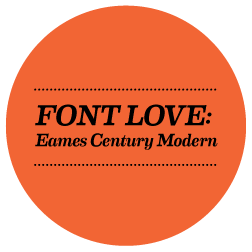 Available as a set of 26 fonts (with 18 serif typefaces, crazy numerals, ornaments and frames), Eames Century Modern has it all. It's literally the perfect addition to your font book, and has some serious style. Plus, it looks beautiful paired with another one of House Industries' creations (and one of my favourites), Neutraface! Images in graphic from House Industries. Graphic was put together by me. Visit the Eames Century Modern page on the House Industries' website for more information, and to see all the typeface has to offer. Also, House Industries will send you a free catalog (I requested to have one sent in the mail, and am waiting for it to arrive) if you fill out a form on their site. And guess what - you get a free font too! Click here to order the catalog, and get your free download.